A corner store in the heart of Chicago’s South Side is not where most of the media attention around Syrian refugees in the US is focused, but that is often where you will find Faiza Kalam. Faiza has been a key leader for IMAN’s corner store campaign since she recently arrived in the US as a refugee. As she pursues a Ph.D in Nutrition at the University of Illinois at Chicago, Faiza has been integrally involved in IMAN’s efforts to transform corner stores into more holistic sites for healthy food access and community building. While hateful and polarizing rhetoric scapegoating Syrian refugees intensifies in the wake of the horrific terrorist attacks in Paris, Faiza and many like her are deeply engaged with our communities. 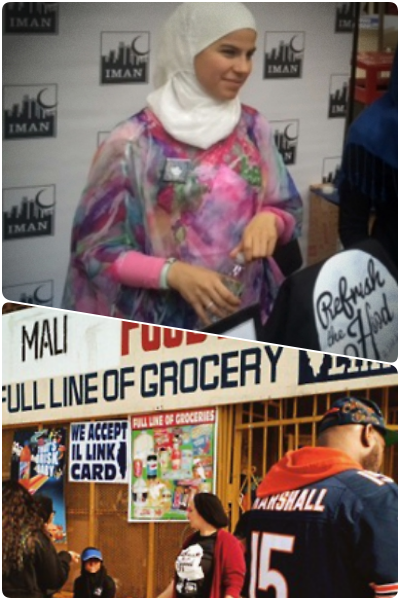 Meet Faiza and learn more about her work with IMAN’s corner store campaign at our Annual Fundraising Dinner on Saturday, December 12th. This entry was posted in One Chicago One Nation, Organizing & Advocacy, Uncategorized and tagged EOYE, refugees, Syria by IMAN Staff. Bookmark the permalink.